B&b Domus Quiritum, recently renovated by a renowned Roman architect and decorated with furniture from the 1800s, is on the second floor (with elevator) and has three rooms with private bathroom, a large breakfast room, and a small attached apartment where we live. The three rooms – the Artist’s Room, the Traveler’s Room, and the Astronomer’s Room – have high ceilings and large windows that face onto the tree-lined square (Piazza dei Quiriti), a bed with hypoallergenic, ergonomic and breathable Memory Foam mattress and pillows, air-conditioning, 32” TV and Wi-Fi connection. The spacious ensuite bathrooms each have a window and a large shower. We provide linens and towels, hygeine kit and hair dryer. The breakfast is served every morning in the breakfast room. The products are all local and the cookies, jams, cakes, fruit juice and honey are homemade using products from our garden. We leave these sweets in the breakfast room throughout the day in case you want to enjoy them with an afternoon tea. 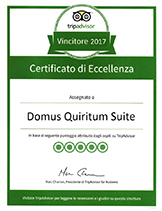 B&B Domus Quiritum is in the heart of Rome, in the Prati neighborhood, once known as “Prati di San Pietro” (The Lawns of St. Peter’s). In fact, St. Peter’s Basilica is very close, just a 10-minute walk crossing the picturesque medieval district called Borgo. It’s also a short walk from Castel Sant’Angelo (less than 350 meters), Piazza del Popolo (less than 1 km) and Villa Borghese (less than 1 km). The closest metro stop is just two blocks away (Lepanto, Line A), making it easy to get to Termini station or the Colosseum.